On Friday, November 9th – doing good will taste great too! 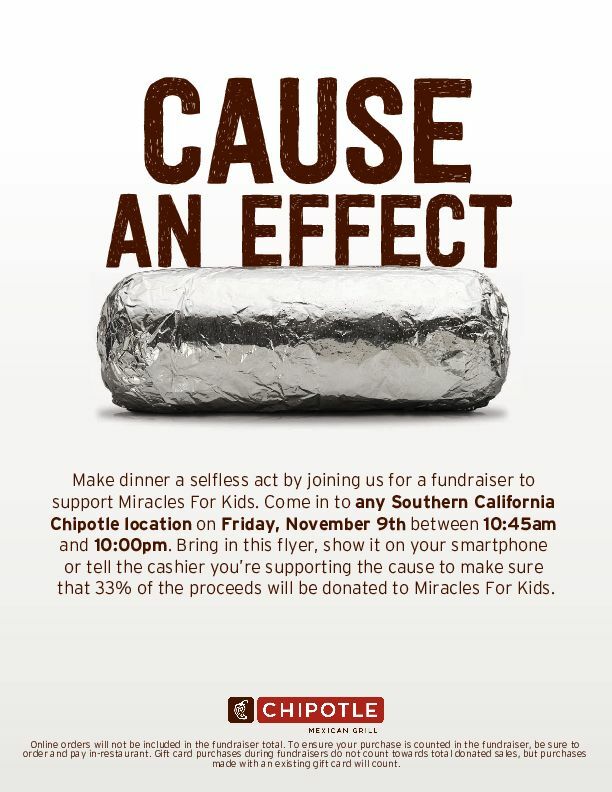 Stop by any Southern California Chipotle and before paying, tell them you want to support the Miracles for Kids Fundraiser – and just like that, 33% of your purchase will be donated to Miracles for Kids and our mission to improve the lives of critically-ill children and families in need. 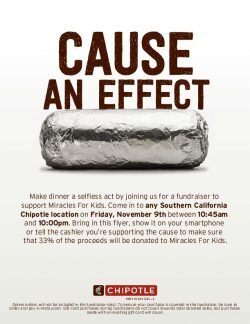 All in store orders and catering orders placed 24hrs in advance by calling 1-800-CHIPOTLE that are paid for and picked up on Friday, 11/9 are eligible for the fundraiser when you mention Miracles for Kids and show them the FLIER below. Please join us and cause an effect in support of the children and families we serve!